This area, on the edges of the Old Kingdom, is home to all manner of giants - and their base for maurauding... understandable given the thin and sparse vegetation of their own territory. There is lots of information about giant races and other creatures living here, as well as adventure ideas and OCCs and skills useful to players wishing to venture here. 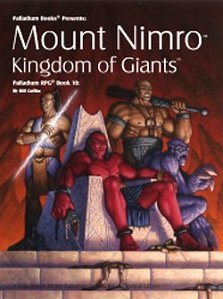 Publisher's blurb: "That's right, the Mount Nimro region is the domain of giants: Jotan, Nimro, Gigantes, Cyclops, Gromek, Trolls and others. A gathering of clans, tribes and refugees that is quickly becoming a true "kingdom" rather than a motley collection of misanthropes. A Kingdom of Giants that frightens the surrounding human, elf and dwarf settlements and is beginning to concern even the Western Empire. Get all the details for yourself!"